Yellow and red is a nice combination. These colors go well with Diwali. Few years back also I was wearing another yellow sari on Diwali. See the blogpost here. This sari is 23 year old. It has resurfaced after a gap of 23 years. 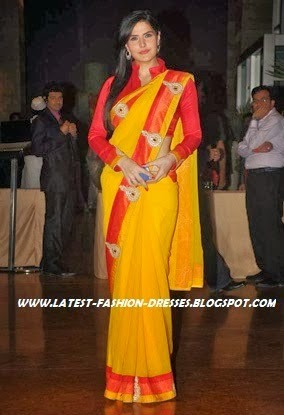 At that time it was named Draupadi sari as Draupadi was depicted in Mahabharata wearing this sari. The necklace is a gift from husband on this Karvachauth. Bangle bought on Dhanteras. See the image here. What are you wearing today on Diwali? 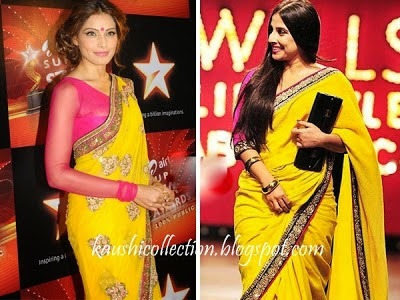 Check some Bollywood stars wearing yellow and red.